Whether you’re shopping for a new boiler or are looking for a contractor to service your existing one, the experts at Toshack can help keep you warm and comfortable during the cold winter months. 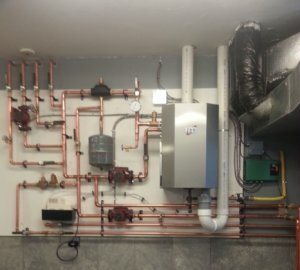 We offer installations, service and an entire line of premium Lennox, NY Thermal, Weil-McLain, Slant/Fin, Viessmann, Navien and Triangle Tube boilers. Boilers don’t circulate dust and are easy to care for with no ducts to clean and no filters to change. They don’t distribute allergens, so they can be a fantastic option for indoor-allergy sufferers. Boilers offer outstanding zone control. Radiant heat won’t cause your home to be dry and uncomfortable during the winter. With a boiler, you don’t have to worry about blocking heat sources or keeping doors open to circulate heat. Enjoy high energy-efficiency and low energy costs. Learn more about our boiler options. Call Toshack in the Smiths Falls, Brockville, Cornwall or Kingston areas today at 1-888-547-6162 or at 613-342-9381 to see how we can help you. Or, schedule your appointment online.